N-Trig, the Israeli company behind the digitizer tech in the Surface Pro 3 and many other top Windows tablets and convertibles, has updated its website and now offers a link to a line of replacement pens available via Amazon. Currently discounted to $40 from their $50 list price, the DuoSensePen2 models are not compatible with all N-Trig digitizers. The new pens can only be used with the following devices: Microsoft® Surface Pro 3, Sony VAIO® Duo 11/13, VAIO Tap 11, VAIO® FIT Family, Acer® Aspire ® R7 572, ASUS Taichi 21/31 and Fujitsu Stylistic Q702. The pens come in an assortment of five colors. I recently had a chance to compare the DuoSensePen2 (above, green) with other N-Trig pens from (top to bottom) Sony, Microsoft and Acer. The new model is a full inch shorter than the Surface Pro 3 pen, although it surprisingly doesn't feel much lighter. A clip cap would be a welcomed addition and help to better balance the pen in the hand. 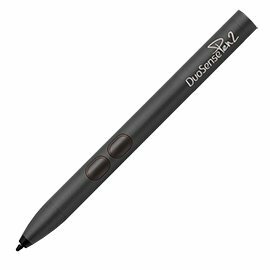 The DuoSensePen2's nib is about the same consistency as the SP3 pen, slightly softer than the Sony's. Unfortunately, the pen does not ship with any spares. Of the four N-Trig pens I've tried, I most like the feedback from the Acer Active Pen from my Aspire R7-572 convertible. Be aware that Acer's latest models use Synaptics digitizers and are not compatible. 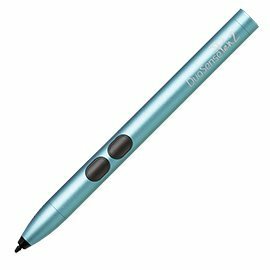 With the Surface Pro 3 pen selling for $50, these new N-Trig pens are a nice option if you'd like to save a few bucks on a replacement or spare. Hopefully for the next generation, N-Trig will lengthen the pen to a standard size and perhaps design a flared barrel that's closer to a traditional paintbrush. The N-Trig site has a long list of Wintab-compatible applications. As you might tell by the low volume of posts in recent weeks, things have been a little slow on the Windows tablet news front lately. Thanks to reader Michael Pearman, we just learned that N-Trig has issued a new update to its Wintab driver, available here. This driver is required for older software that does not support Windows' real-time stylus. I'm downloading it now and will update the "Surface Pro 3: What Runs, What Doesn't" feature accordingly. N-Trig has published its own extensive list of compatible software here. If you have a chance to test the driver with older software, please let us know your findings in the comments section below. UPDATE: Sad to say, the new driver doesn't appear to help the performance of Illustrator CS6 or CC on my Surface Pro 3. The software still misses about every fourth pen stroke. Let me know if your performance varies. Release of N-Trig's long-awaited 64 bit Wintab drivers closes the gap with competitor Wacom. Users of N-Trig equipped hardware such as the Sony VAIO series or the Acer Aspire R7 no longer have to settle for running 32-bit versions of Photoshop and other software that require Wintab drivers for pen pressure. Thanks to reader Jeffrey Chow who just informed me that N-Trig posted a 64-bit driver on its support website earlier today. You'll find the download links on the right side of this page (see photo above). This is another big step in closing the compatibility gap between N-Trig and rival Wacom. I'll test this with my two N-Trig convertibles in the next couple of days. Please report your findings in the comments section below. UPDATE: The Flip 11A is now available to order from the US Sony store. LAS VEGAS, Nev. (CES booth #14200) – Jan. 6, 2014 – Sony today announced a new addition to its VAIO® | Flip PC lineup: the VAIO Fit 11A | Flip PC pre-installed with Adobe® Photoshop® Elements 12. In addition, the VAIO | Flip PC 13-inch, 14-inch and 15-inch, VAIO Tap 11, VAIO Tap 21 and VAIO Duo 13 and VAIO Fit 14E and 15E models are updated with Windows 8.1 and Adobe Photoshop Elements 12 for Spring. The VAIO Pro 11 and 13, VAIO Tap 11 and VAIO Tap 21 models will include 802.11ac next generation wireless connectivity technology for Spring. The unique design of VAIO | Flip PC maintains the full functionality of a conventional Windows 8.1 notebook PC with the ability to switch between laptop, tablet and viewer modes. Available now in an 11-inch compact model for everyday use, the VAIO Fit 11A | Flip PC is a no compromise laptop/tablet enabled by a unique hinge featuring an iconic one line design. With the power of Sony, the VAIO Fit 11A | Flip PC fuses stunning picture quality TRILUMINOS™ Display for mobile and ClearAudio+, Sony’s unique technology for enjoying high-quality sound by bringing together expertise in digital signal processing technologies. The front-facing camera and 8-megapixel rear-facing camera is powered by Exmor RTM for PC and Exmor RSTM for PC image sensors developed by Sony. At just 2.82 lbs., the amazingly thin and light VAIO Fit 11A | Flip PC is beautifully crafted in black, silver or pink aluminum and features a full pitch backlit keyboard, gesture enabled touch pad and palm rest for comfortable typing. To power through the most demanding projects, VAIO Fit 11A | Flip PC model is equipped with latest Intel® Pentium® Processor featuring Quad Core and Solid State Drive. Sony VAIO is collaborating with Adobe to empower people’s creative vision and turn snapshots into something spectacular. By including a pre-installed version of Photoshop Elements 12 with support for the VAIO Active Pen, about a $100 value, now everyone can easily enhance and create with their photos. Photoshop Elements 12 offers powerful photo editing with three editing modes to accommodate every skill level, multiple output options, content aware technology, an easy to use photo organizer, and mobile albums so you can access your Photoshop Elements photos on your mobile device. VAIO Fit 14E/15E starts from $579 and is available mid-January; VAIO Flip 11 starts from $799, VAIO Flip 13 starts from $1129, VAIO Flip 14 starts from $799, VAIO Flip 15 starts from $899, all VAIO Flip | PC available from end of February; VAIO Tap 11 starts from $799, VAIO Tap 21 starts from $999, both available from mid-February; VAIO Pro 11 starts from $1149, VAIO Pro 13 starts from $1249, VAIO Duo 13 starts from $1399, all VAIO Pro and VAIO Duo available from early April at Sony retail stores (www.store.sony.com) and other authorized dealers nationwide. Users can simply press the ASSIST button to launch VAIO Care software to effortlessly install new software and drivers, quickly identify and troubleshoot issues, create restore and recovery media, and connect with a Sony expert via phone, chat or online. Sony will even repair select PCs in person with limited warranty Onsite/In-Home Service. Sony was awarded as the Tech Support Showdown Winner 2 years in a row by Laptop Magazine. UPDATE February 1: MobileTechReview has published a companion to the video below focusing specifically on the Flip and pen applications. Despite some of their limitations (weight, fan noise, N-Trig), I'm a big fan of the Sony Flip series and think the 15A in particular is a very good value ($1299 with active pen). In case you my previous write-ups haven't convinced you, my favorite video reviewer Lisa Gade of MobileTechReview has just posted an excellent and lengthy look at the convertible. Enjoy! Lisa Gade reviews the Sony Vaio Flip 15, a 15.5" Windows 8 convertible Ultrabook. This is the largest Flip model and it's a thin and light mainstream laptop that works well as a main PC. UPDATE March 20, 2014: N-Trig today published 64-bit version of its Wintab driver. See this post for details. Sony and N-Trig have taken a major step closer to Wacom-equipped competitors with the release of a hotfix for VAIO devices with active digitizers. The "Pen Pressure Update Software" installs a driver named N-Trig Wintab x32 that enables pressure sensitivity in 32-bit versions of Adobe Photoshop. I've confirmed that the update works with Adobe Photoshop CC on my Sony VAIO Flip 15A. Other users on the Sony Community site have reported success with 32-bit versions of Photoshop ranging all the way back to CS2. Available for download from Sony's eSupport site here, the update is dated September 26, 2013, but curiously Sony does not link to it as part of machine-specific updates. In fact, the link to the list of Applicable Products on the download page is broken. I can't fathom why the manufacturer would keep this a secret, because users of Duos, Flips and other N-Trig enabled VAIOs have all reported success with the software. Installing the software requires a reboot and doesn't create a Control Panel entry. The only indication that the software has installed correctly is in the Programs and Features control panel, which will list the driver. Although limited to only 256 levels of pressure, the results in 32-bit Photoshop CC are still impressive. Without a control panel to adjust the pressure curve, it takes a bit of concentration to achieve the lightest strokes. I haven't tested the driver with other Wintab applications, but 32-bit versions of programs like Corel Painter should also benefit from the update. UPDATE January 10: From my limited testing with SAI 1.2 Beta 5 and ZBrush 4R6, it appears only Photoshop recognizes this driver. Demanding professional users will likely miss additional levels of pressure and the lack of 64-bit support is disappointing, but for hobbyists or doodlers, this update puts the Sony VAIO Flip 15A towards the top of our list of Windows 8 convertibles. It's hard not to fall in love with its ample 15.5 inch display which makes even the unscaled Photoshop UI accessible to touch. For more details on the Flip, see our earlier post here. Thanks to Google+ follower +IvorThomas for the heads up about this update. Competition in the 15+ inch Windows 8 convertible space is beginning to heat up with the release of Acer's Aspire R7 refresh. The Core i5-equipped model R7-572-6423 is sold exclusively at Best Buy for $900. This includes 8 GB of RAM, 1 TB of storage and a 15.6-inch 1920 x 1080 display with N-Trig active digitizer support. The closest size competitor is Sony's VAIO Flip 15A which retails for $1250 at Best Buy. That extra $350 nets you an i7 processor and NVIDIA GeForce GT 735M graphics vs. the Acer's Intel 4400. You can get a comparably priced Sony at Best Buy by going with the Flip 14A. Below are unboxing shots with first impressions. On the box sleeve, the Aspire resembles the Starship Enterprise. This is a little deceptive because the screen is not meant to work at this angle. The box itself is an elegant black carrying case very reminiscent of Apple packaging. Inside the box is the Acer with prominent silver Ezel hinge, a keyboard palm rest, power supply and cord, cleaning cloth and manual. I was surprised by the included palm rest until I inspected the keyboard. For some odd reason, the touchpad sits above the keys and bottom row of keys sits very close to the bottom edge of the device. You will definitely need that palm rest in order to type comfortably on the R7. UPDATE: In my rush to post the unboxing pics with my first impressions, I totally blew my assessment of the Aspire R7's Ezel mode. The trackpad placement allows you to position the touchscreen closer to you, theoretically replacing the need for a touchpad. Although there's a little bit of flex, the screen remains surprisingly stable at this position. I wouldn't draw at this angle, but perhaps traditional painters may find this orientation useful. Swiping and tapping while browsing is definitely easier than standard laptop mode, but desktop touch targets will force you to reach for your stylus or a bluetooth mouse. UPDATE: Less chance of needing Gorilla arms to reach out and touch the display in Ezel mode. In this browsing, consumption mode, the lack of room to rest your palms at the bottom of the keyboard may be less of a problem. Or you can just use the padded palm rest that's included in the box. UPDATE: Kiosk mode is also surprisingly stable, though I don't see myself ever using the device like this. Another surprise is that the screen doesn't lie entirely flat in tablet mode. The angle is a nice pitch for drawing but it's not as thin as you would like for a drawing slate. UPDATE: This angle also results in a significant amount of screen flex. See the video below. In this shot, the wedge shaped VAIO Flip 15A is in the foreground. You can see how much taller the R7's screen is in the tablet position. The Acer Aspire R7 side by side with the Sony VAIO Flip 15A. The Acer screen is 1/10 of an inch larger, but it's very difficult to tell. Image quality on both devices is very good, but I'd give a slight nod to the Sony. I much prefer the fit and finish of the VAIO. If you can live with the N-Trig digitizer (no Photoshop, Painter or other Wintab program pressure sensitivity), the Acer is a decent option. It's a pleasure to draw on a 15+ inch display though it comes at the cost of extra weight. The R7 weighs 5.3 lbs so you'll definitely want to keep this on your desk or lap as you work. Don't think about holding it in one hand. The keyboard keys have a bit more travel than the Sony's and feel a little squishier. A lot of users have complained about keyboard flex in the Sonys, but it doesn't bother me too much. I also prefer the Flip's brushed aluminum finish, although I like the rubberized bottom of the Acer vs. the plastic bottom of the VAIO. The keyboard and trackpad placement is terrible for standard laptop use, but it's secondary if you want to use this primarily as a drawing tool or in Ezel mode. The omission of a pen is odd, but it doesn't ship standard with the Sony either. The pen costs $50 direct from Acer vs. $30 for the Sony pen. Opening, closing and transitioning between laptop, easel, tablet and display modes is very easy compared to the Sony. However, it's not possible to lock the screen in place, which could be an issue for some. UPDATE: I've run into an issue with the R7 that may force me to take it back before I'm able to do much more testing. The screen is intermittently shutting itself off in tablet mode. This unit may have a defective or loose connection. Acer ships with a lot of custom apps that seem redundant with Skydrive and other Microsoft standards. In my brief tests of the pen, accuracy seems very good and perfectly in line with what I've seen on the Sony. If you're a Manga Studio artist, be assured that you can work very comfortably with 256 levels of pressure. UPDATE: In tablet mode, the R7 has quite a bit of flex on the screen which some may find distracting. See the video below for a demonstration. Despite the superiority of Wacom tech, these lower cost N-Trig entrants will surely put downward price pressure on the Surface Pro and others. UPDATE: The $350 price difference (Best Buy configurations only) is not insignificant, and either convertible will work for Manga Studio, ArtRage or Sketchbook Pro artists. But in my estimation, the Flip is the better way to go for those wanting the largest possible Windows 8 portable art solution. As much as I want to keep the Sony VAIO Flip 15A for its beautiful 15.5 inch screen, today I've encountered a crippling defect that makes it useless as a tablet. The problem had occurred a couple of times before today, but I did my best to ignore it because I was more focused on getting the laptop set up and so that I could answer the pressure sensitivity question for a few apps. But today, the issue has occurred so many times that I'm tempted to just give up, pack it up and return it to Best Buy tonight (maybe I'll use the refund to pick up a PS4 instead). The issue is that the tablet service will randomly stop running, making the Flip unresponsive to either pen or touch. A workaround is to run the calibration program again, which restarts the service. This ridiculous inconvenience might be tolerable if you only had to perform it once or maybe twice a day. But I've had to do this no fewer than six or seven times today and I've only used the laptop for a couple of hours. Normally, I'd give Sony the benefit of the doubt and assume I just got a bum unit, but careful reading of various reviews online all mention having had the problem at least once. For example, here is a quote from Engadget's review of the Flip 15: "Also, while the touchscreen mostly worked as it was supposed to, it occasionally failed to respond to our taps or it registered our finger input incorrectly. " And on the Sony Community, there is a growing thread on the problem. And just like they've done on complaints regarding fan noise, the response from Sony has been total silence. So if you were thinking of picking up a VAIO Flip, my recommendation is definitely to wait until Sony releases either a firmware fix or issues a recall. Despite its 3-inch smaller screen, that Lenovo Thinkpad Yoga is looking pretty good right about now.